Blizzard’s arena in Los Angeles, California is the real deal. And by that, I mean it has a gift shop, the surest marker of any worth-its-salt sporting enterprise. I have investigated the gift shop; here is a definitive ranking of the items for sale in it, from worst to best. Yep, that sure is a shirt. These sure will look good in whatever drawer I toss them into when I realize, five minutes after buying them, that I’ll never use them. This might’ve been ranked higher had I been able to see the water bottle, but as is, I don’t really know what I’m working with here. Have you ever walked through a room, been told that something was in that room, and realized you have zero recollection of it because that object was so nondescript as to essentially render itself invisible? Absolutely not, even though there’s basically no other Pharah merchandise in the store. The D.Va one is kinda cute, though. Figure out what month it is! With the help of Tracer, a being trapped outside of time! I’m not 100 percent sure what these are. They look fine. Elaborate keychains are bad. Hardly anyone aside from you ever sees them, and they make your keys heavier and your pockets bulgier. The Overwatch League ones look kinda cool, but I’ll keep my keys naked and free, thanks. These are mostly alright, though I think some of the color schemes work better in this format than others. Also, the Jack In The Box logo on the Dallas Fuel jersey looks like a giant, angry pimple on your chest, and I just remembered that I’m not Kevin Smith, so I would probably never wear these outside of events. He’s small! He’s gold! He still doesn’t do a ton for me as a character! I want to hug it, but it also feels kinda weird that I’ll have to bust open Bastion’s head to free it from its cardboard prison. The logo takes up too much real estate, and the coloration means you’ll look like Naruto’s evil twin if you wear it, but otherwise it seems like an alright jacket. Less gaudy than the jacket. Better logo, too. I might actually wear this. 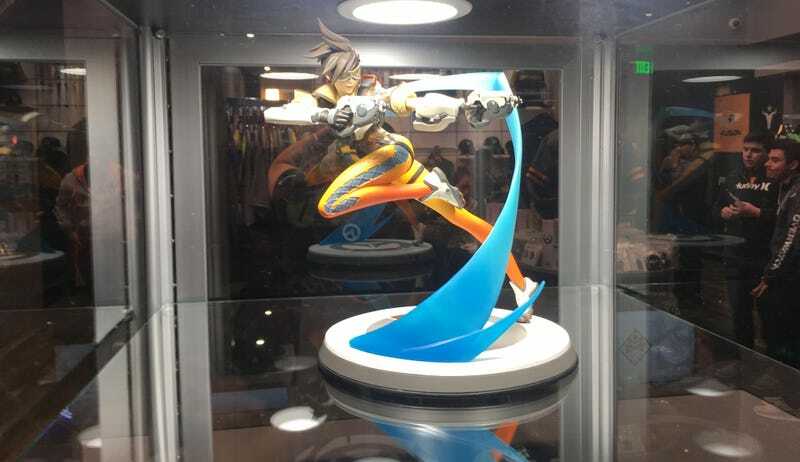 A very nice statue of Reaper that probably costs multiple hundreds of dollars. I dig it, but not at that price. Simple and sleek. I like it. I don’t even play much Sombra, but this mini-figure is good as hell. It’s Tracer! She appears to be going fast, but, as a statue, is also forever constrained by the cruel shackles of time. A good metaphor for Tracer’s character, actually. This thing is massive—around twice the size of the other statues—and nicely detailed. I would like to own this, but I’m not a wealthy man, and my apartment probably isn’t worthy anyway. This shouldn’t be so high-ranked, but I can’t say no to that face. They made Bastion so cute that I don’t hate him anymore! An accomplishment. How can they put this in a store? It belongs in an art gallery.